So I’ll start this blog with my current obsession … upholstering my chair. Prompted by the good Mr W, I had a good look at what I wanted to do with myself earlier this year, post-baby ‘n’all, and I came up with the over-ambitious idea that I wanted to do a textiles degree, maybe go into restoration for museums and stately homes (ahem). Coming back down to earth and realising I needed to keep bringing in the bacon (plus keep some FOCUS in my life), I figured a more realistic aim would be an evening class of some sort. Upholstery just fulfills a need for me … it somehow fits in quite neatly with my web coding head need for step by step mind numbing detail. Although it can be creative, it’s not wildly artistic and there are a set number of steps you need to go through to achieve an end result. I love working with the frame of the chair, all the effort (by someone else!) that went into carving it, bringing it back to life. The creative part sneaks into the construction – how do you want to shape it? What fabric to use? Do you use buttons? How are you going to finish the wood? Dark wood furniture is out of fashion at the moment so you can pick things up relatively cheaply – criminal really, considering the amount of thought and work that went into these things in the first place. 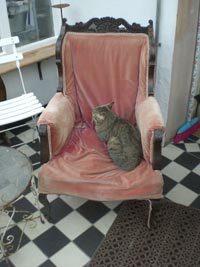 I picked up a couple of Edwardian chairs at the local auction house for £70 (including commission) and sold the smaller one for £25 to another upholstery newbie. It had some badly tacked-on pink velour covers (see above – nice huh?) over the original, green, incredibly faded chintzy fabric (see left). But it had a faded grandeur and a dignity about it that I loved. I got all artsy and analytical about it at first, the fact that it was made pre-WW1 at a time when the Empire was fading but there was still a bit of time and money left to put some effort into things, before ideals got blown to bits along with a generation. I loved the carved back, the idea that this was, at the end of the day, a fairly common chair made out of cheap wood (as I found out pulling the tacks out and another splintered shard fell off), but a good deal of craftsmanship had gone into it. 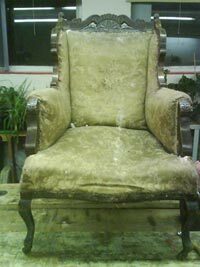 Now I just love it as a good old chair that I’m bringing back to life … I’ll keep posting my progress, it’ll be fun to look back on when it’s finished! glad you’ve kept us all updated…..